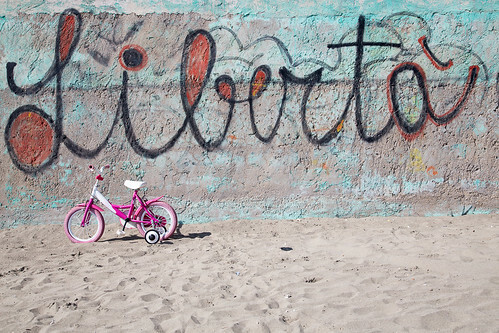 When I was a child, a pink bicycle was never my idea of liberty. Nothing pink would do, nor anything shaped like a bicycle. But in these changing times, a pink bicycle with stabilisers to help us find a route through the challenges that life throws at us, could be exactly what we need. Liberty to wheel ourselves away from danger. Liberty to unleash our inner child. Perhaps freedom can only truly exist on two wheels, whether it’s a full-throttle motorbike to roar away at breakneck speed. Or the gentler pace of a child’s bicycle, reminding us of exactly how free we used to be, and still can be if we just remember to engage a lower gear and find ourselves some stable ground.